One of the requirements that is introduced at Grade Two, is a good delivery. Every retrieve must be properly delivered to hand. Some young gundogs will hold and deliver a dummy nicely with little encouragement. Some need a bit of help. But for others, delivery can be a real sticking point. Problems vary but often include dogs that persistently drop the dummy, or dogs that won’t recall with a dummy. [wp_ad_camp_1]And dogs that will bring the dummy back, but refuse to let go of it. Some get terribly excited and try to play with or even destroy the dummy. Some dogs will deliver nicely at home, but fall apart when they get hyped up outdoors. Traditional methods for dealing with delivery problems have varied results, and it is was not unusual for a dog to be rejected from a traditional gundog training programme for persistent delivery problems. This is one area where modern training methods can offer significant advantages in the gundog training process. Traditionally, gundog trainers have avoided offering edible rewards for returning with a dummy. Largely because a dog cannot eat, and hold a dummy at the same time. So edible rewards encourage him to spit the dummy on the ground. Traditionally, gundog trainers have also avoided punishment to resolve delivery problems, for fear of putting dogs off retrieving altogether. Some traditional trainers will however teach a form of ‘forced hold’ where the dummy is placed into the dog’s mouth and he is praised and encouraged for keeping it there. A forced hold can be a tricky thing to get right, and if not handled sensitively may end up making a dog hate dummies. Fortunately, modern methods of dog training have been developed that use an event marker to overcome these problems. The event marker identifies specific aspects of the retrieve so that the dog can be rewarded for holding on, even after he has let go. Sadly, one of the most effective event markers we have, the clicker, has received a bad press in gundog training circles over the last few years. It’s purpose was and sometimes still is misunderstood and so this incredibly useful tool is only just beginning to be used to resolve delivery issues. Your dog needs to hold on to the dummy until you are ready to receive it. This needn’t be long at first, you don’t expect a dog to hold a retrieve for hours on end. But if you are working on a shoot, there will be times when you need your dog to hold on to his bird long enough for you to finish what you are doing and give him your attention. If your dog has a natural delivery to hand, you can encourage him over time, to hang on to the retrieve a little bit longer. But there is no point in making an issue of this. If your young, inexperienced dog, puts a dummy into your hand, take it and be grateful. So when do we need to specifically teach a hold? Primarily for dogs that spit out the dummy as they approach you. Spitting out the dummy is a bad fault in a gundog, as placing a wounded bird on the ground may allow it to flap away and suffer. Incidentally, dogs that drop a ball, will quickly find it rewarding as balls roll and bounce and can be grabbed and dropped repeatedly. So don’t practice retrieving using balls if your dog does this. If your dog repeatedly spits out his retrieves onto the ground, you may need to teach him to ‘hold’ and one of the best ways to do this, is with a clicker. You can find out more in the clicker retrieve series. When your dog brings your dummy back to you, he not only needs to hold on to it. He needs to lift up his head and present it to you, so that it is easy for you to grasp. 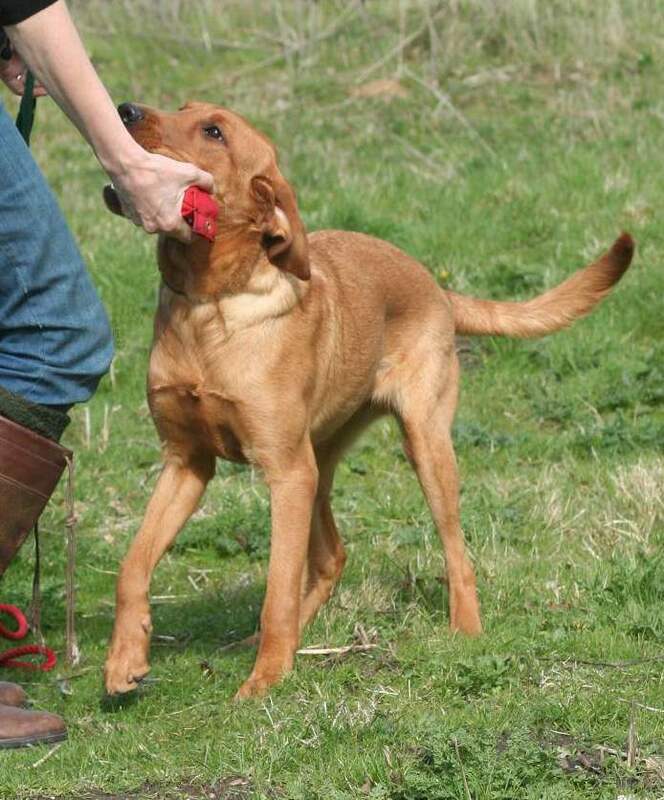 So many novice gundog owners end up grappling with their dog in the most unseemly fashion, partly because they have not taught the dog to present the dummy. And partly because they are afraid he might drop it, or change his mind. Typically, a young dog may dip his head as the owner stretches out their hand to take the dummy. Sometimes, this dog is in a bit of a dilemma. Part of him wants to give you the dummy, but a part of him wants to hang on to it. Sometimes he wants to try and engage his owner in a game. A game where he turns away, and you chase after him. Either way, this is not a behaviour you want to encourage. To get a good presentation of the dummy, keep your hands up high and away from the dog’s mouth as he comes in. Don’t take the dummy until he lifts his head. If he ducks his head when you stretch out your hand, remove your hand immediately and wait for him to present. If this results in him dropping the dummy then you can always teach a ‘hold’. But in some cases, this behaviour arises because the dog wants to hang on to his prize. The final part of the delivery is the release. Some dogs are only too happy to hand over the dummy once they have reached their handler. Others would rather hang on to it. Refusing to let go is quite common, and can recurr when a dog gets on to game. Avoid getting in a tussle with a dog that does this. He is only likely to grip harder and this is not something you want to happen. Traditionally trainers used all kinds of methods to resolve this problem, including ‘blowing up the dog’s nose’ and ‘pinching his ear’. With varied results and side effects. Again, the ‘release’ can now be taught quite simply, using an event marker, and some edible rewards. Remember, if you are going to use rewards in resolving delivery problems, you must use an event marker, and you must follow a structured training process. Otherwise you will simply end up with a spitting out problem to add to your woes. In conclusion, there are problems in forcing dogs to hold or let go of dummies. Whereas the drawbacks of training the delivery using rewards, have now been overcome. Never let any gundog trainer tell you that your dog will not make a retriever because he will not hold or release a dummy. These are problems for which we now have reliable, effective solutions. All dogs of any breed that are physically capable of holding a dummy in their mouth, can be taught to pick-up, hold, and release a dummy into your hand. Failure to hold or release a dummy is never a reason to exclude a dog from gundog training. As a young dog is introduced to longer retrieves, or simply to retrieving in new locations, standards that you have established with your ‘hold,present, release’ may slip. Silliness sometimes creeps in, and it can be useful to rehearse some neat deliveries under controlled conditions. One way to do this is to put the dog on a lead and ask him to hold and release the dummy several times. If the dog has a tendency to play with or chomp on the dummy, then getting him to practice holding ‘on the move’ can be helpful. Most dogs will not be silly with a dummy whilst walking along at heel. You can read more about this in a forthcoming article: The Walking Hold – where I will show you a short video to illustrate the technique.